Retro furniture from the 1950s is nearly as popular today as it was when it was first created. 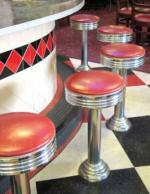 Many identify it as diner style furniture that used chrome, naugahyde vinyl upholstery and laminate table tops. It may sound like something best used in restaurants or quirky rec rooms, but retro style furniture from the 1950s fits in well with modern day decor. From bar-height tables perfect for loft style apartments to sectional sofas that fit open design living rooms, retro furniture can lend an eclectic design element to many homes. 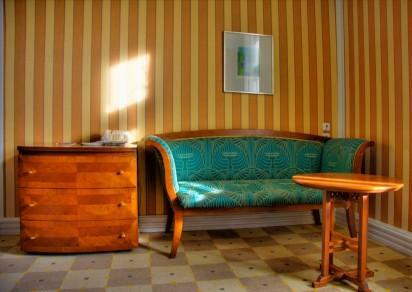 The 1950s furniture designs were most influenced by Scandinavian and American designers. Movies and television shows helped promote the new look of sleek furniture lines and splashes of color. Furniture upholstery reflected the excitement of a war-free country with bright colors like lime green, lavender, yellow, pink and combinations of red and black. Recreational rooms were the latest floor plan addition to homes. Certain pieces of furniture were often found in this entertainment room. Dining rooms were still used for lunch and dinner, but the 1950s style included light-colored veneers for the table, matching chairs, china cabinet and breakfront. Bedroom suites also reflected the new blonde look in furniture; twin beds became popular with a nightstand placed between the two single beds. The diner collections were very popular for kitchen designs. Many kitchens still used a table in the center while others had breakfast nooks just off of the kitchen or to one side of the room by a large bay window. Vintage and reproduction furniture pieces are both available. Consider how well the vintage piece has survived when purchasing; many of the metals used were of varying quality and quite a few weren't rust resistant. Evaluate the quality of the vintage piece and determine if you can live with its flaws or possibly refinish it. For the purist vintage collector, refinishing is tantamount to destroying an authentic piece. You can find authentic vintage 1950sfurniture on eBay and other Internet websites, but one of the best places is your local flea market or antique furniture store. Consider that when buying local you can see the piece in person and save on shipping costs. The most obvious advantage of purchasing a reproduction piece of furniture over a vintage one is that you're buying a new piece of furniture. The finish and materials are the latest innovations and give you the look without compromising comfort. You can create an authentic looking décor without having to deal with possible construction or aging material issues found in vintage pieces. The classic car couch is the ultimate collector's piece and conversation item. Created to look like the wide backseat of a 1950s car, park one in your rec room to give your guests something to talk about. You can find retro furniture for rooms other than the kitchen or dining room; you can decorate your entire home with this period style of furniture. Wood veneers were used for 1950s furniture with sleek lines and chrome accent features. Lawn furniture underwent a transformation as well with the ever popular shell-back metal chairs, rockers and loveseats available in almost any color imaginable. Once you've made your furniture selections, add some accent pieces to complete the overall 1950s retro furniture designed room. Highlight tables and seating areas with some mid-century modern lighting pendants and sconces. Place colorful Fiestaware on your chrome dining set and pick up the bold colors from the furniture in tabletop accents. Furniture styles from the 1950s work well in any home; consider adding a chrome dining set to a glass and concrete kitchen or place a Naugahyde sofa near some floor to ceiling windows. Use a little or use a lot; this furniture style will never look truly dated.